Each year I spend a couple of weeks in late April or early May working like a dog. I am lifting, shoveling, digging, shifting, smoothing, raking, pruning… I am doing the work of a gardener, planting seeds and preparing my beds for a season of productivity, growth, and nutrition. And each year, I find myself at the middle or end of May and the beginning of June and I’m, well, stopped. The garden isn’t finished, of course. That won’t happen until a couple of weeks into October at the earliest. But there comes a time when the work of preparation ends and the work of nurturing, of waiting, of anticipating, and of cultivating begins. In a few hours, we’ll get on a plane and fly for five hours to Dubai, UAE. Not long after that, we’ll get on another plane and spend fifteen hours winging our way towards Washington, DC, where we’ll unearth my old Toyota and head for Pittsburgh. 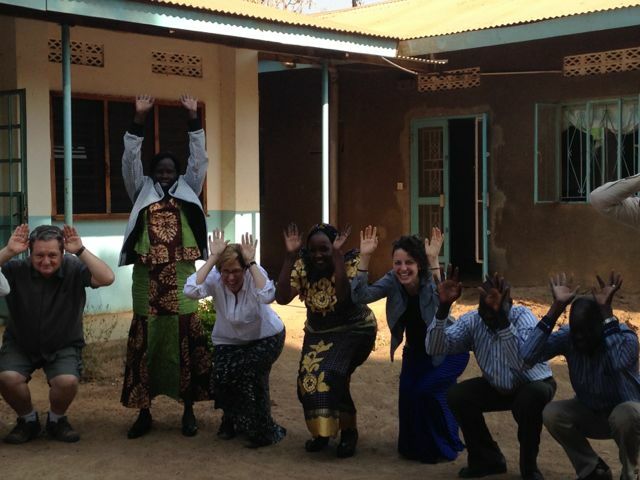 Our time in South Sudan has come to an end. If you were to ask me what we’ve done, the first thing I’d do is point you to the six prior entries in this narrative. But the reality is that each of these only provides a description of how we’ve spent our time. In reality, what we’ve done is the work of the gardener. We can’t stand here now and point to a school or a church that’s been built because of the work of our hands; there were no rallies or crusades. Just as my garden doesn’t look all that fruitful on Memorial Day, there is not much apparent in South Sudan or ourselves that is different now as compared with eleven days ago. But of course, planting seeds is a significant and prophetic act. Even when the nature of the landscape has not significantly been altered, the reality of that place has changed as the seed lies latent in the soil. And so it is when the seed lies latent in the soul. There is change, growth, pushing, stretching, breaking, climbing and…eventually, Lord willing, a harvest. 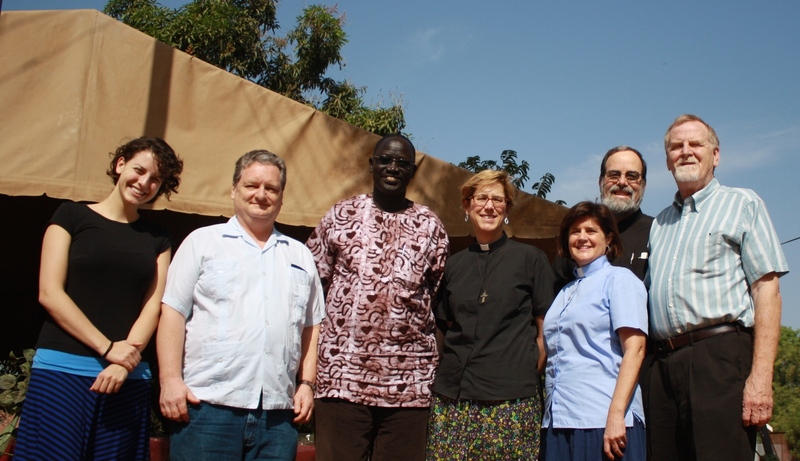 We have met with a team of church leaders from the Nuba Mountains, a region in Sudan that is facing daily atrocities at the hands of the Sudanese government. Some have termed this “genocide” – and it surely seems like the Christians and others in that area have been targeted for destruction. You can learn more about this situation by clicking here or here. 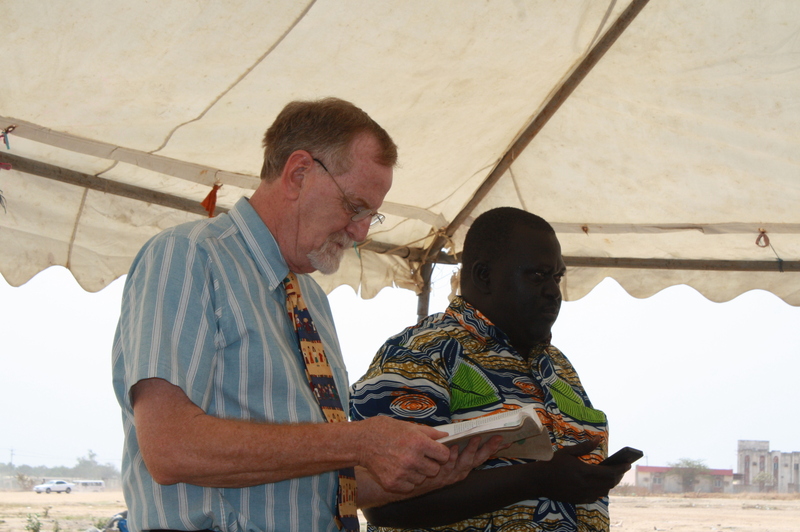 We re-engaged the churches of the South Sudan Presbyterian Evangelical Church by participating in worship. On Sunday January 25, five of us were privileged to preach in congregations, and Pastor Gary accompanied our friend Pastor Thomas into the women’s prison, where he had a deeply moving experience. 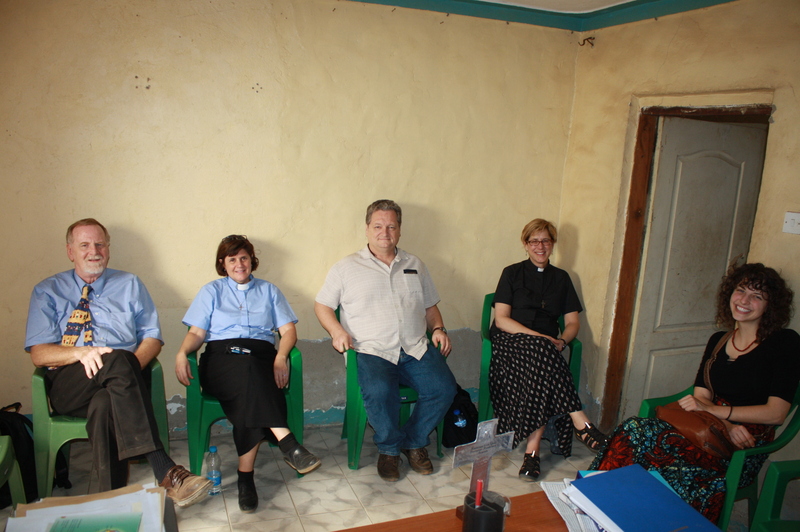 We have shared space here at the Guest House with our colleagues from the PC (USA) Mission Agency. 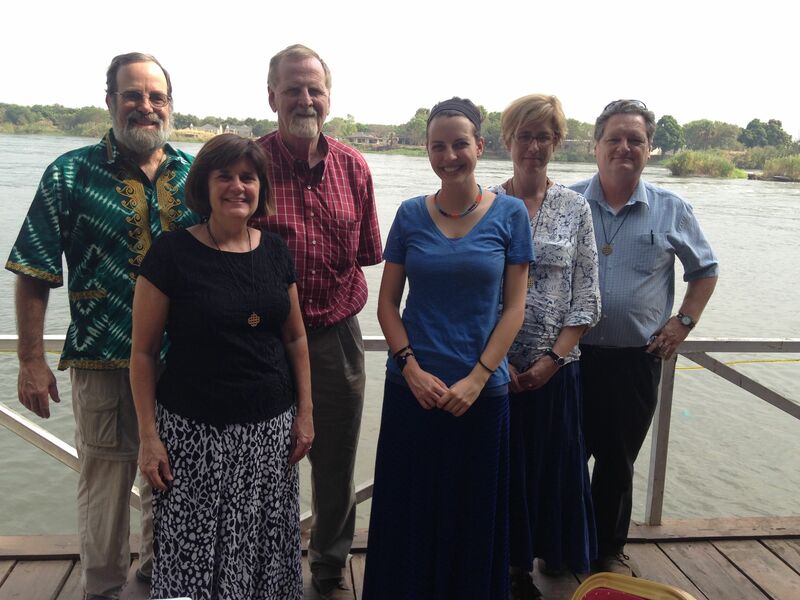 A small team of leaders from our denominational headquarters and the denomination’s Washington Office is in this region and it has been a blessing to share our experiences with them. 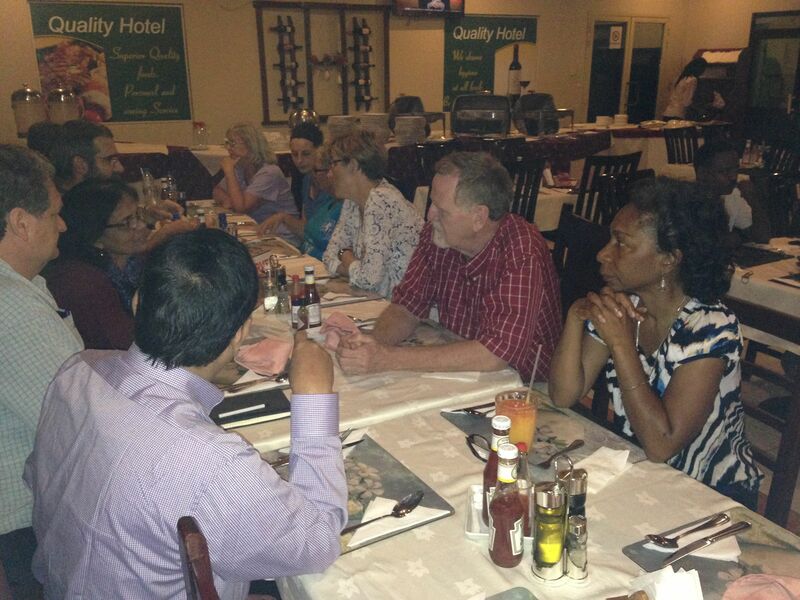 We have been humbled to spend time with seven of our church’s Mission Co-Workers. Normally, these pastors, educators, development specialists, and evangelists are scattered throughout the nation, but because of the tense situation throughout the country these days, they are all concentrated here in the capital. We were thrilled when they accepted our invitation to dine together and share a some of their heart with us. For a few hours, we were just tourists. We visited the markets, lunched along the Nile, and explored the city. 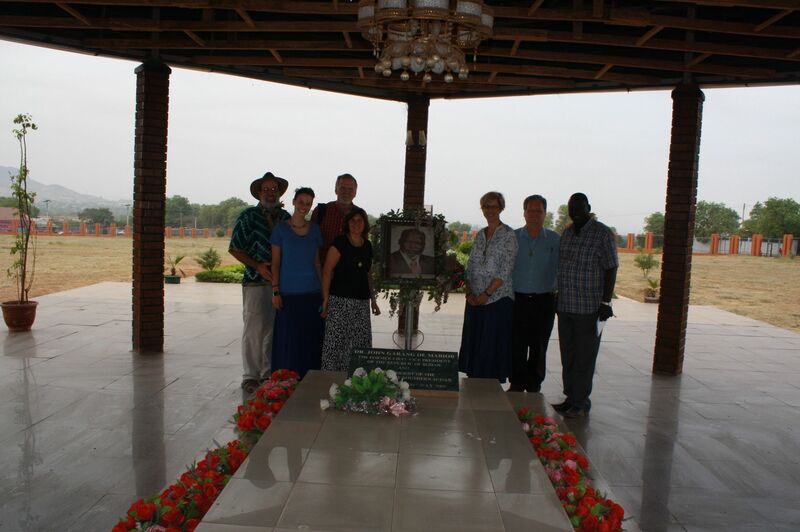 Particularly moving was the opportunity to visit the monument to Dr, John Garang, the man who is most deeply associated with the independence of South Sudan. As I have said, when visiting another place, it’s always a good idea to learn about the person whose face is on the money, and here, that person is John Garang. As we prepare to get on the plane, I’m ready to tell you that we feel a little like my garden must feel in mid-May: torn up, plowed under, turned around…and ready. We have been given this experience. We carry seeds that as yet have not borne much, but we trust that the work of this trip does not end when we get on the plane. This is the view from Jebel Jesu (“The Mountain of Jesus”), the church in which I preached on Sunday. As far as you can see there are dwellings – none of which, I was told, existed five years ago. This speaks to the explosion of this region since independence in 2011. Pray with us, and pray for us. Pray for seeds sown in our lives and in the lives of those with whom we’ve come in contact these days. Pray for those who live in fear and uncertainty, and for those whose days are shaped by the horror of what one human being can do to another. And pray for those people anywhere and everywhere who would seek to live in a way that reflects the Lord’s intentions of peace, wholeness, and prosperity for all of God’s people. The past two Sundays I have preached from Isaiah, and pointed to the ancient prophecies of healing and redemption. I’ll close this narrative of tilling, toil, plowing and seed-planting by offering his words. Just as the seed packet bears an image of the fruit that is to come in due time, so these words from scripture describe the end for which God has destined his creation. Jebel Jesu, the worship site where I preached on 25 January. Lunch along the Nile River. 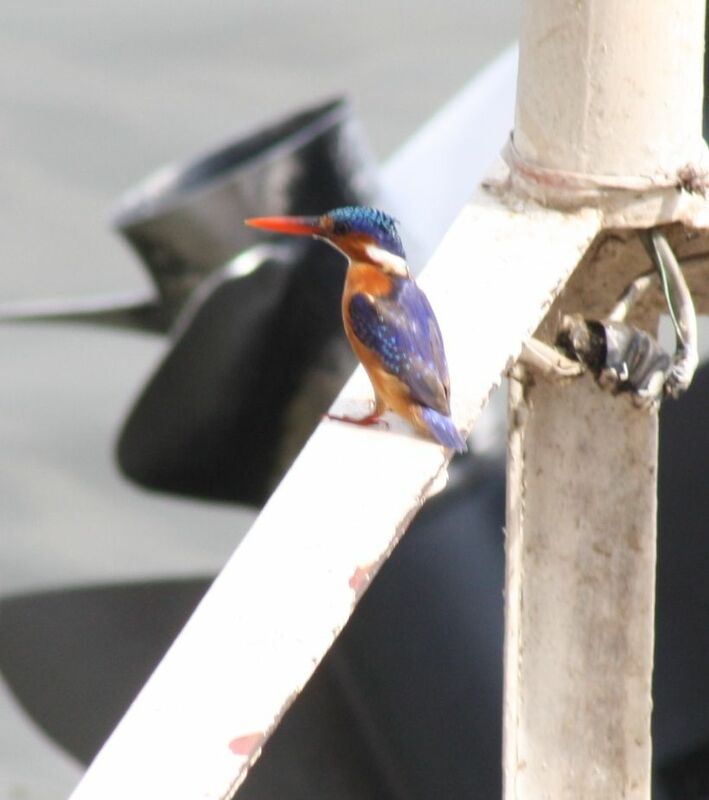 We were joined along the Nile by this little fellow, a Malachite Kingfisher (my favorite bird!). We were presented with lovely gifts by the Women’s Desk at a farewell banquet on Sunday evening. 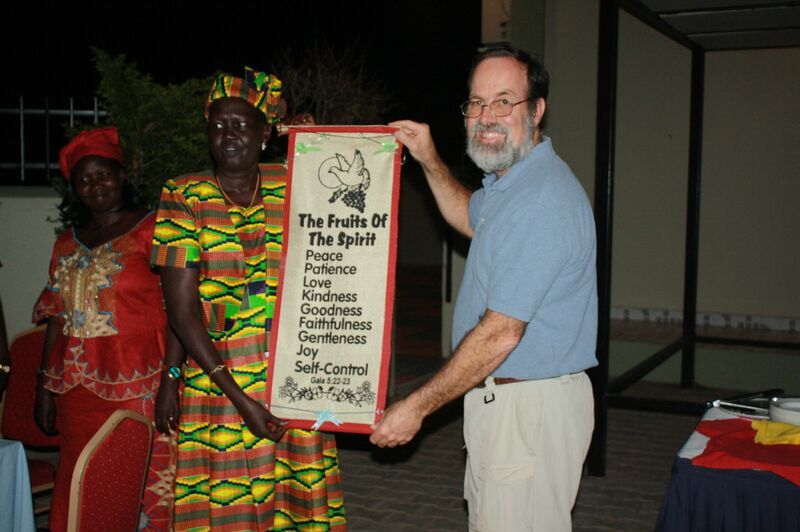 The banner presented to Pittsburgh Presbytery by the women of SSPEC details the Fruits of the Spirit. May we nurture those in our lives and in our world. “This retreat has been a real blessing. It has been more than one year since we have slept outside the UN Mission Camps, and here in Yei it is so quiet and dark and peaceful. When I am in the camps I can’t sleep. It is noisy and people are fighting and crying so much that I can’t fall asleep until midnight or even 1 a.m.” That’s the evaluation that Pastor James offered concerning his impression of the retreat that the team of six from Pittsburgh Presbytery and seventeen leaders from the South Sudan Presbyterian Evangelical Church (SSPEC) shared on the grounds of RECONCILE International in Yei, South Sudan. 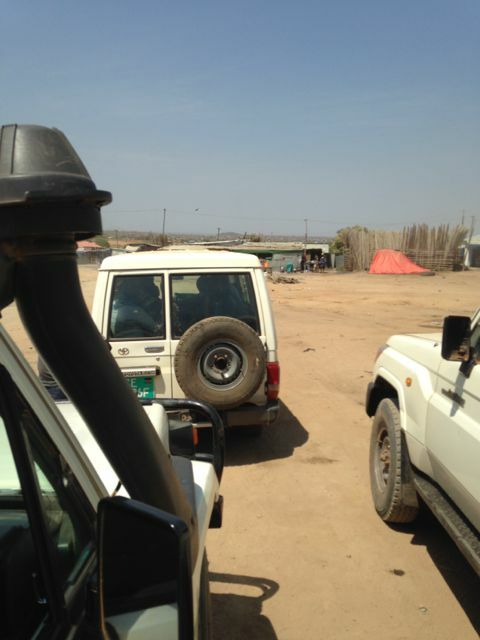 Our team is back in the capital city of Juba now, preparing for the last leg of this amazing journey. 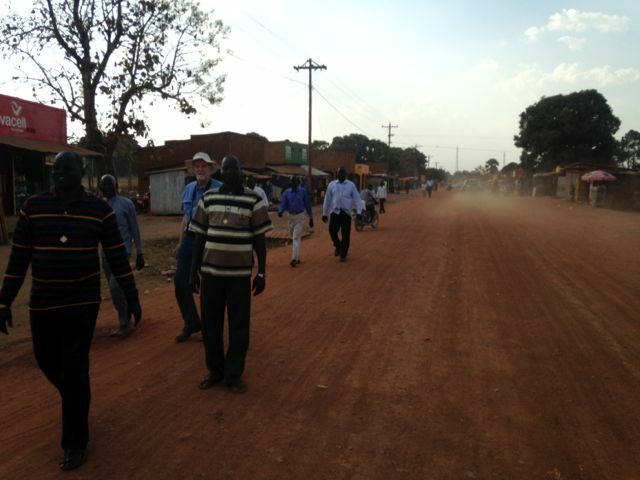 The slower pace of last night and this morning gives us time to reflect on the week that we spent with our brothers and sisters in Yei, a bustling community about 60 miles (a five hour drive over, shall I say, ‘punishing’ roads). The roads were hard on us and our equipment. The 23 of us traveled in three vehicles like this. Here, we experience a minor delay for a tire change. The purpose of the trip was to engage each other in a setting that was welcoming to all and home to none. 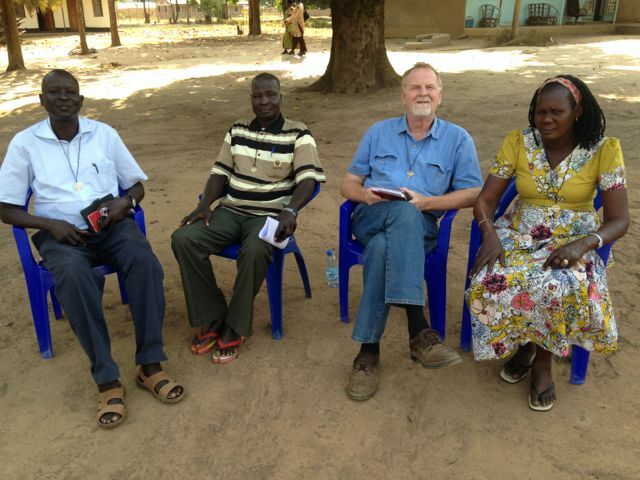 We almost achieved that – it turns out that one of the SSPEC pastors grew up in Yei, and his father had been a chief there. 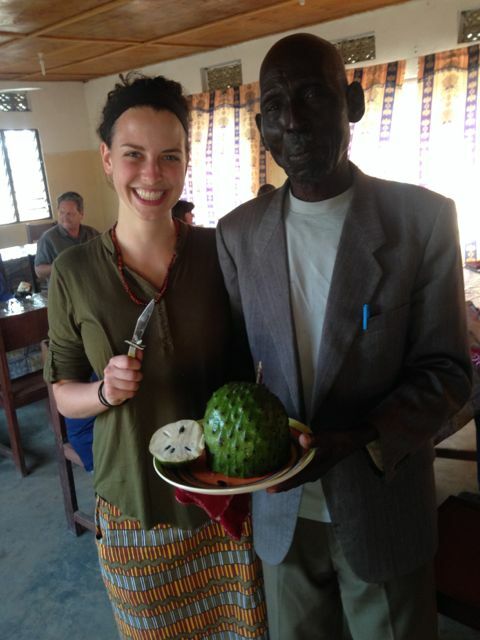 So “Chief”, as he came to be called by both Americans and South Sudanese, took great delight in showing us places that were familiar to him and introducing us to fruits unique to that region. We were disappointed in that a family illness prevented our PCUSA mission co-workers and friends Nancy and Shelvis Smith-Mather from being able to participate in the discussions, but the staff at RECONCILE was more than hospitable in their absence. There were three main content areas of our time together. As mentioned in a previous post, the Rev. Peter Tibi led us in some amazing conversations about the nature of trauma, healing, and steps towards peace. In our last session together, Peter challenged all who were present. “The future of South Sudan depends upon the Upper Nile [the region of the country in which the conflict of the last year has been most intense]. 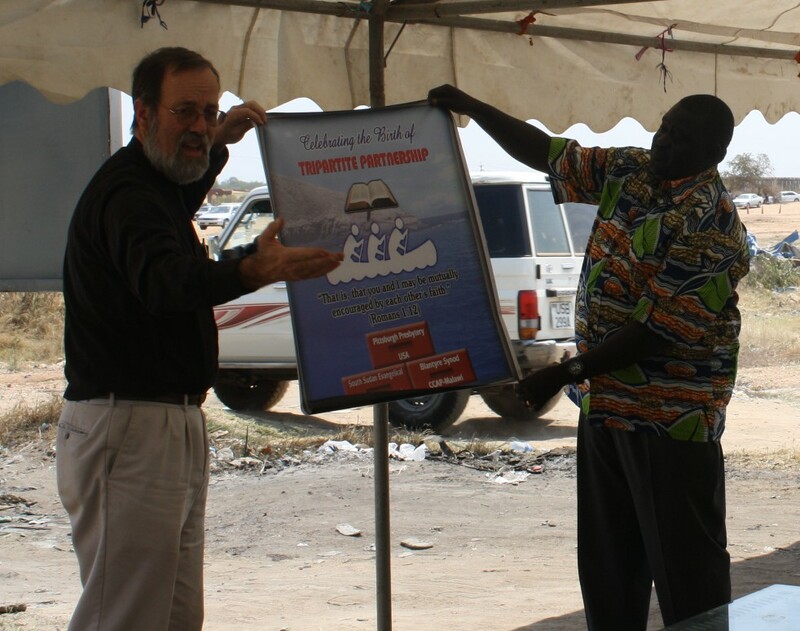 And the fate of the Upper Nile depends upon the ability of Presbyterian Pastors to come together and help their churches to put a stop to this and to recover from this trauma.” He then looked at us and said, “And the Presbyterian Church in South Sudan cannot do this alone. They are the ones who can go to Upper Nile, and they are the ones who must speak to their people, but they need to be equipped and encouraged. You and your churches must stand with them and help them.” Each of the six Pittsburghers felt the weight of that challenge. We also sensed that in the Rev. Tibi, we were in the presence of a true spiritual giant in the field of trauma, reconciliation, and peace-making. The second way in which we spent our time was under the leadership of a man named Abanzi, who has been trained in team-building and group process. Through a variety of lectures and presentations, Abanzi helped us to understand how best to engage and motivate varied members of the community to work towards a common goal. 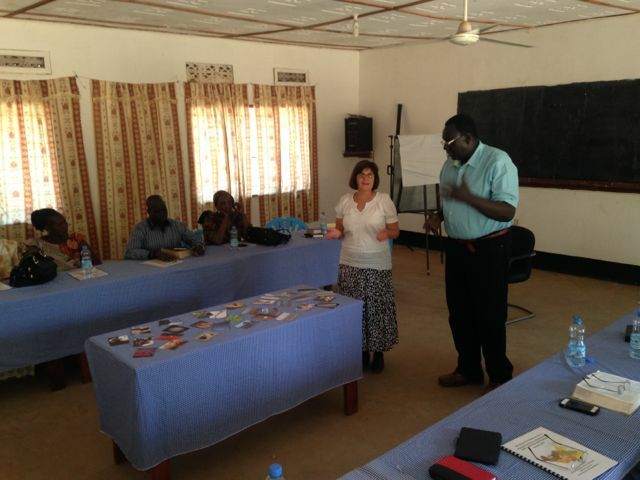 While many of us, Americans and South Sudanese alike, felt as though we’d be able to apply these lessons in our specific ministries and lives, the real fruit of our time came in the ways that Abanzi’s insights helped us to grow together in partnership and friendship. 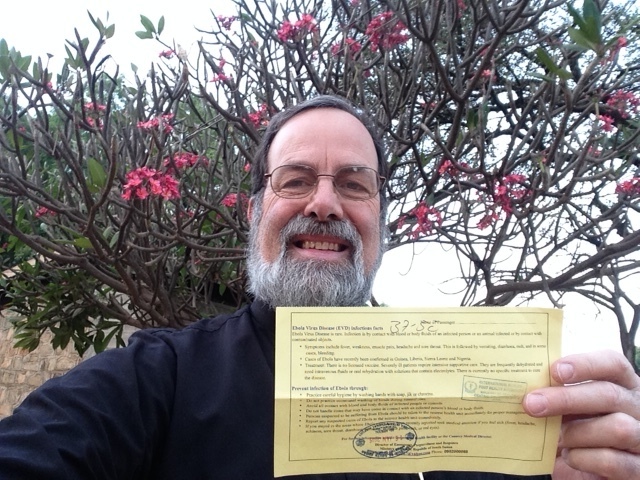 We responded to the input from the Rev. Tibi and Abanzi in worship and prayer. Our daily worship was facilitated by Pastor Gary, Pastor Moses, and me. The highlight for many of us in this regard was the ability to come together in small groups for conversation and prayer. This gave us the chance for personal, intentional sharing. During the last of our gatherings, each participant was given a small Jerusalem cross. This cross is formed by one central cross, representing the centrality of the life, death, and resurrection of Jesus Christ in the life of the world. Surrounding this are four smaller crosses, representing the four gospels that are to be taken to the four corners of the globe. In addition, the larger cross is made of four shapes that are reflective of an ancient crutch, reflecting the truth that the gospel, intended for healing, can only be carried by those who have been wounded themselves. These crosses were distributed by means of a “cross-warming prayer”, wherein each of us held the cross of a fellow team member and prayed for them by name and then passed that cross around the circle. By the conclusion of this exercise, we were all wearing crosses that had been prayed over by the other members of our small group. We arrived safe and sound in Juba and will spend today in some “sightseeing” around Juba and preparing for our worship leadership tomorrow in various churches around the city. We appreciate your prayerful support and encouragement. A group-building exercise in cooperation and communication. Shouting encouragement and instruction to one whose vision is limited. The closing circle of worship was deep and rich. 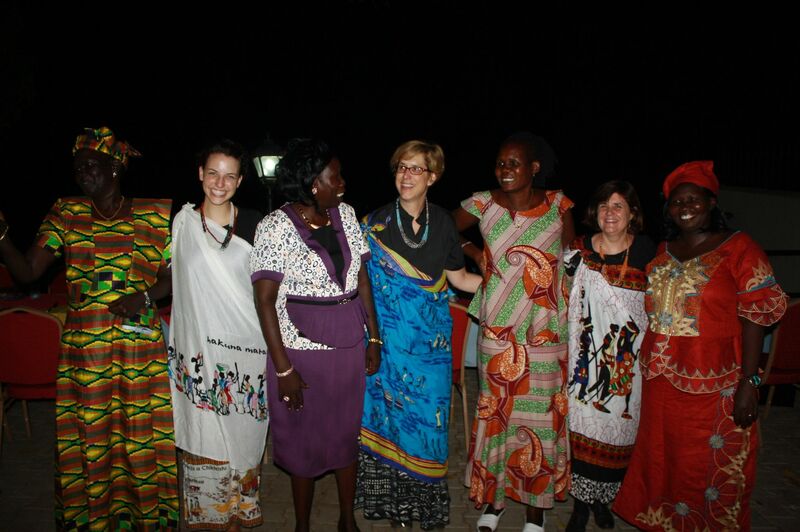 The group of 23 who shared the time in Yei. The road we share continues. And we are grateful for that. I was not a part of those conversations, but they sure looked like fun. “Bob” and the other guys would take turns talking; there was often laughter, usually adult beverages, and always at the end of them someone would come over and tousle my hair and tell me to go play and have fun. Sharon leads an icebreaker (although i’m guessing that they don’t call ‘get to know you’ activities ‘icebreakers’ when it’s 102°!) with Zachariah translating. This week, our team of six Pittsburghers is gathered with a group of 17 leaders from the South Sudan Evangelical Presbyterian Church (SSPEC) to create a situation wherein these folks might find a safe place to tell actual war stories. Virtually all of these men and women have been displaced from their homes in the past decade as a result of war and independence for this nation, and all of them have suffered some level of trauma in the past year as fighting has raged across their countryside. Some are staying in rented homes, others with friends, and still others in the UN compounds. Bring all 23 of us to a quiet place away from our daily lives so that we might be free to build relationships with each other and the Lord that will lay the foundations for enhanced partnership in the future. Introduce our friends from SSPEC to the resources and facilities that are present at RECONCILE in the hopes that in the days to come, our partners will be able to avail themselves of the intensive training and workshops that are offered here around the themes of trauma, healing, peace-building, and reconciliation. It was not easy getting here by any stretch. In addition to the life-events that have led our friends to the place where such a place is needed, there was the logistical challenge of getting 23 individuals across a distance of about 100 kilometers (60 miles) of the roughest road that most of the Pittsburgh team has ever seen. After a four-hour delay in which we finally received the necessary permissions to travel outside the capital city, we set off on this trek, which involved five hours of bone-jarring, dust-eating, “Oh-God-I-hope-we-get-there-soon” kinds of prayer. One of the few places where the road was smooth enough to take a photo! Once we arrived, we were treated to a lovely tea and delicious meal. We’re staying in dormitories and spending our days engaged in group activities such as team building, trauma workshops, worship and Bible study. More than that, there are many hours of wandering in conversations. Ken White and I share a room that is adjacent to the front porch of the dorm. 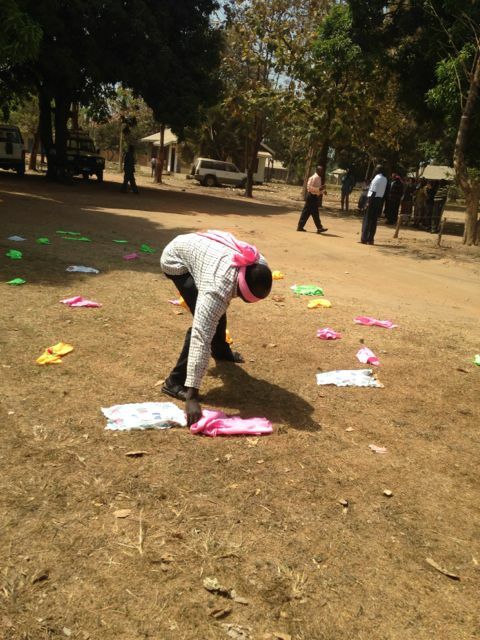 Right outside our windows is a circle of plastic chairs that will be filled by our South Sudanese colleagues during every free moment. Sometimes, Ken and I will sit in the room and we’ll overhear their conversation. Since they’re in Arabic or Nuer or some other local language, it’s not like we’re eavesdropping. But we know what they’re doing: they’re swapping war stories. And I think this is the best place to do that. Listen: our group of Pittsburghers is not trained to offer trauma healing. We understand that we are not sent here to “make things better” for our friends who are leading their church and their nation through challenging times. We’ve come to sit with them, to encourage them, and, in the words of the official application for travel that was submitted by our colleagues at SSPEC, to “show solidarity and support to the people of South Sudan.” We do not take this opportunity lightly, and are honored to be invited into this reality. We ask you to take a few moments now and ask God to bless the healing of this nation and these friends. Some of the photos below show our small groups at work. One of the questions for discussion was “please talk about a hope that you have for 2015”. In my group, it was the shortest discussion. “Peace in our land” was the answer. Oh God, hear our prayers. Amen. “What verse or Bible story speaks deeply to your life?” Discuss. Team building exercise. For the record, the hare jumps over the wall, the wall deflects the arrow, and the arrow defeats the hare. A new taste – for us and for most of our South Sudanese friends! 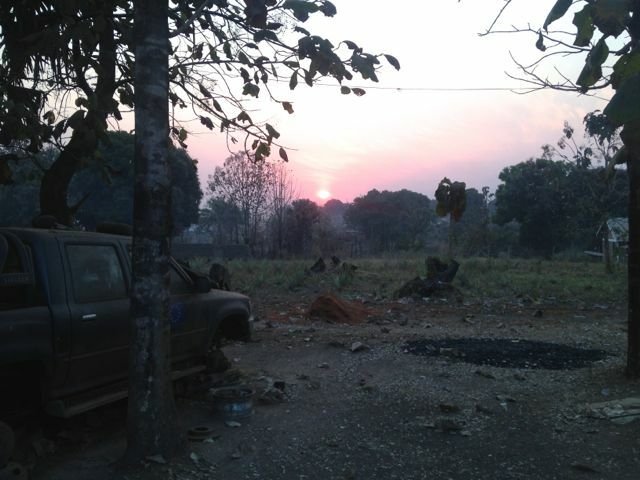 Sunrise in South Sudan. There is a good bit of damage and loss…but every reason for hope. Life remains! Life is a gift! It’s time for worship! 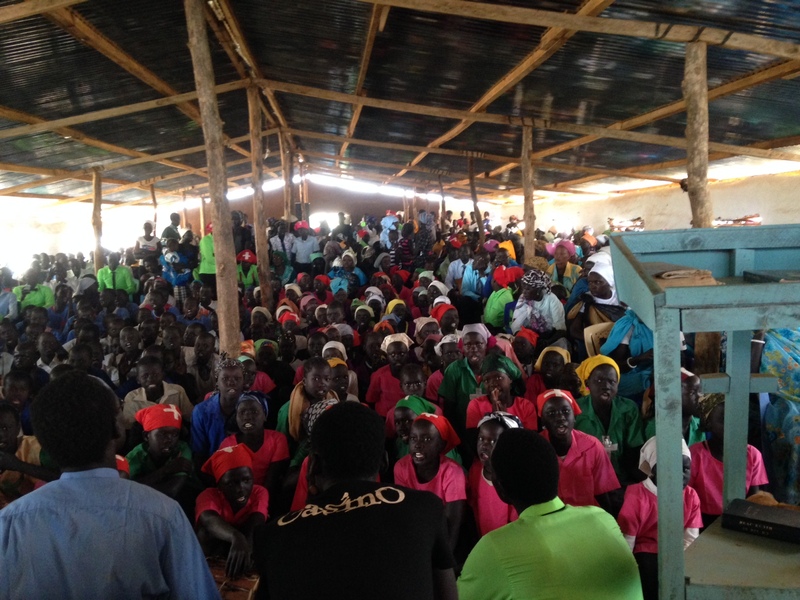 Our team was invited to join our sisters and brothers from the South Sudan Presbyterian Evangelical Church (SSPEC) for worship in six sites this morning, and that meant some degree of uncertainty and anticipation for each of us as we considered the tasks of crafting a message geared to strangers, preaching with a translator, and entry into a whole new congregational and cultural ethos. Poor Ruth had to preach to a room with a bunch of pastors sitting behind her. Several congregations heard a woman pastor for the first time. Fortunately, God’s promise about being with us in times of uncertainty is true…and we were blessed in multiple ways. We preached in all kinds of churches, ranging from a smallish gathering of a few dozen to a camp for Displaced Persons which hosted a service for more than two thousand; many people groups were represented, and all ages were present. The Lologo church, which hosted Sharon today. Inside the Lologo church building. Our afternoon was spent swapping stories of our trips and catching up on naps. 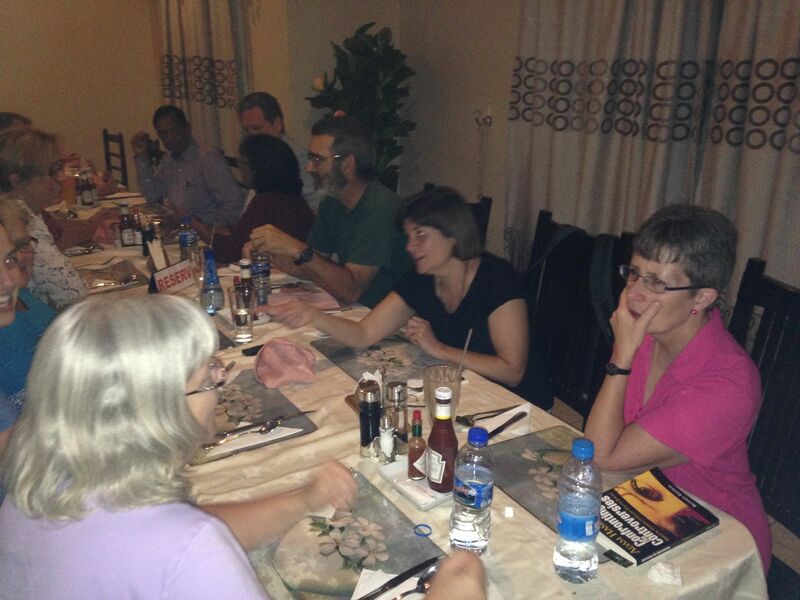 We were surprised and gratified to discover that Michael Weller, PCUSA Regional Liaison for the Horn of Africa, has checked into our Guest House and able to join us for dinner. We truly benefited from his wise counsel and enjoyed hearing his perspective on some of the recent history in South Sudan. One of the gifts that Ruth has brought to the group is a passion for all things vegetative. That’s meant trips to the fruit market and fresh pineapple, bananas, oranges, and watermelon. It was a delightful way to end a deep and rich and inspirational day. What a great way to end a January day that saw the thermometer climb past 100°! 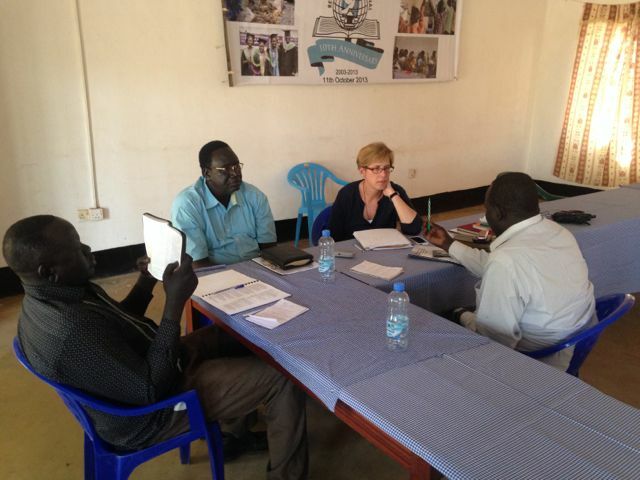 At the office of the President’s Office on Religious Affairs in Juba. 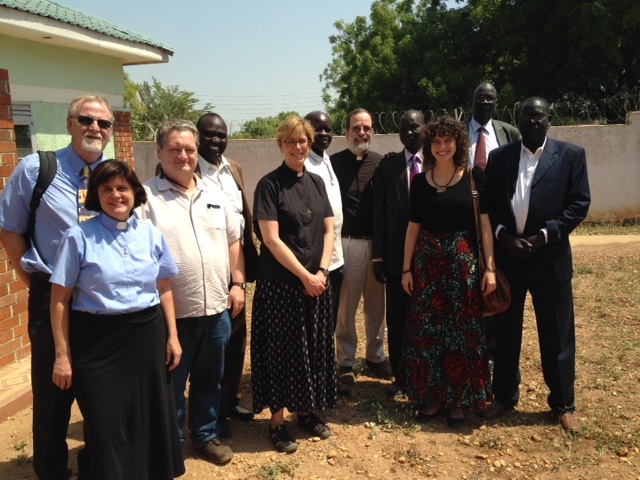 We have spent much of the past two days in meetings with groups of pastors, elders, and leaders of the South Sudan Presbyterian Evangelical Church (SSPEC) in Juba, South Sudan. Time and time again, we have been placed in situations where we hear some horrific problem…how do we deal with hundreds of thousands of people who have fled their homes in view of the political and military strife that has occurred in the past year? How can our congregations be self-supporting when our worshipers do not have jobs? Where are we to gather for worship when so much of what we think of as “ours” is in the north, in Sudan? What do we do to assist the orphans? Three possibilities surfaced in our discussion of these topics. 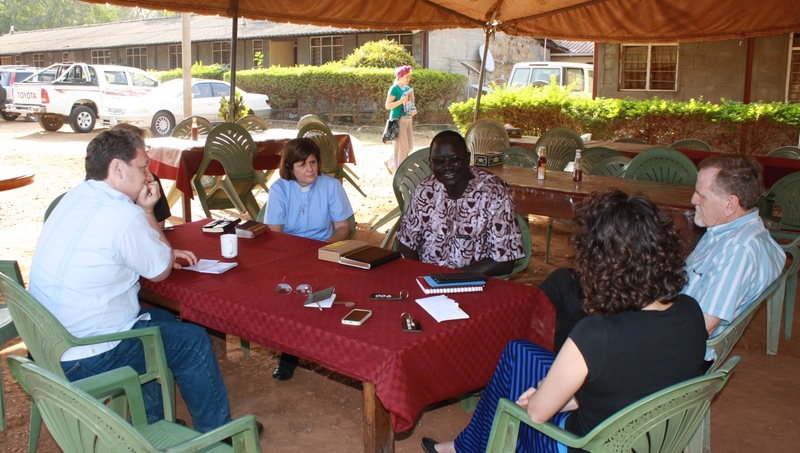 The grounds of the Episcopal Guest House in Juba are a great gathering place for intense and intensive conversations. 1. Let’s help them fix it. After all, we’re bright people, right? A little American ingenuity, a few bucks from a special offering? Come on, guys, we can do this. Let us help you brainstorm ideas to solve your problems right now. You’re welcome. As tempting as that might be to try, we realize that’s not why we’re here, and it’s presumptuous to think that we have any of the cultural awareness, technical skill, and long-term commitment to make #1 a viable option. 2. Problems? What problems? Come on, friends, even Paul in Romans says that nothing can separate us from God’s love. Famine? Persecution? War? Oh, don’t worry friends, these are temporary troubles. They won’t last long. Hang in there and things will get better. Just you wait and see! 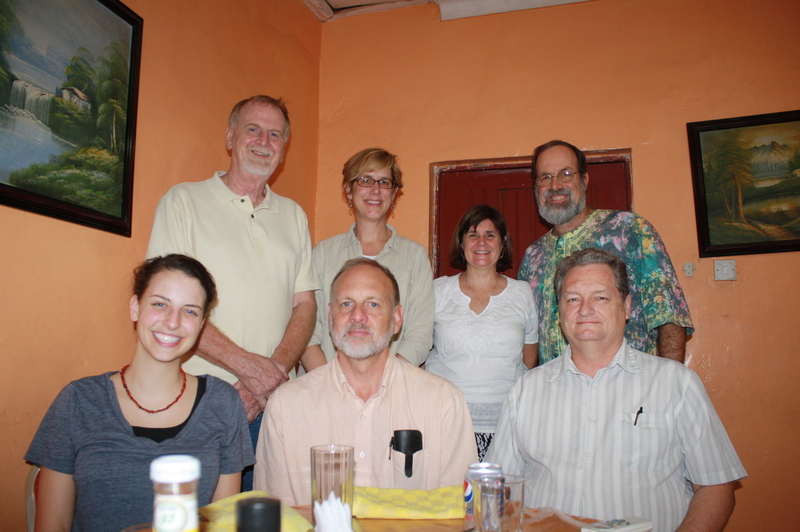 Our team with Pastor Thomas Tut, who shared his passion for ministry with prisoners and orphans. Yeah, well, this is just plain stupid. How can we listen to the stories of our friends and the trauma that they’ve endured and sit there with a stupid grin our our face pretending that it’ll all be better in the sweet bye and bye? 3. You know what? It is too hard. There isn’t much to be done here – the challenge is just too great. Maybe we shouldn’t have even come here in the first place – we’re in way over our heads. This whole trip was just a silly idea to begin with. It’s hard to see how this is a viable option, either. After all, we serve a God who raises the dead, who releases prisoners, who invites us to proclaim Good News to those in distress. Do you see what I mean? The first three options came easily. But they were just as easily dismissed. What is the Fourth Way? After years of searching, our friends at SSPEC have bought a property for use as their headquarters. There’s work to be done, but it looks like it’ll be a great fit. 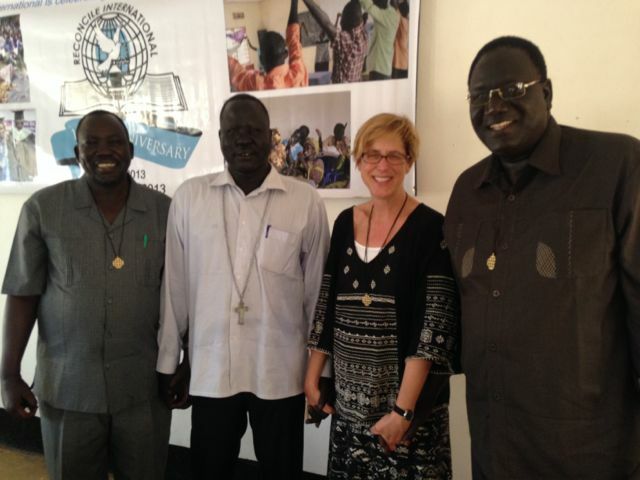 We met on Friday with representatives from the President’s Office of Religious Affairs, with the Religious Advisor to the President of South Sudan, with women’s desk leaders in the SSPEC, and with much of the leadership team at SSPEC. This morning, we were briefed by our friend Pastor Thomas Tut on the difficulties of ministry with prisoners in this context and the challenges of caring for orphans of war while the war is still going on! We were briefed by a delegate at the ongoing Peace Talks in Addis Ababa and heard a report from the pastoral team charged with leading SSPEC worship in the various UN Camps that are housing the hundreds of thousands of Internally Displaced Persons who have been rendered homeless and traumatized by the war. It is heavy, heavy news. Hard conversations in many ways. And #1, #2, and #3 all stink. What is #4? 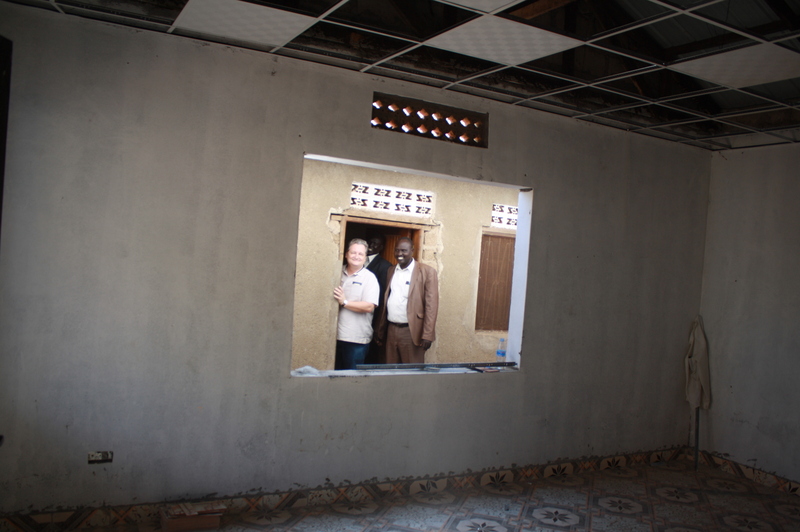 Pastors Gary, Deng, and Philip in the (still-being-remodeled) denominational headquarters in Juba. And much of the prayer was just quietness. Some of it was tears. We gathered with a group of about 75 SSPEC pastors, elders, deacons, and women’s leaders. Ken was our preacher for the day. It was my privilege to deliver the banner that our Malawian partners brought to Pittsburgh to celebrate the tripartite relationship. You may have spent time in an ICU waiting room, or a funeral parlor, sitting on the hard news of having been laid off at your job, or waiting for the results of the big test. And if you’ve done that, you know that when your friend comes to one of those places to sit with you, that friend isn’t going to heal your child or raise your spouse or pay your bills or cure your cancer. But you know that somehow the act of their coming to be with you matters to you, and is a way of communicating that in some way, you matter to them. And mattering, well, it just matters. It counts for something. 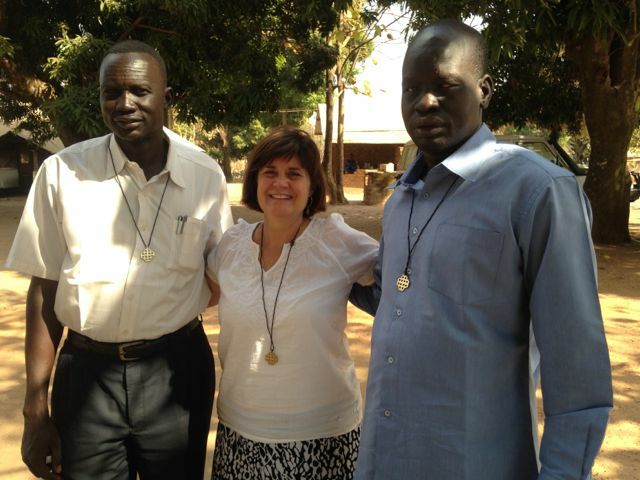 God’s lovely, beloved children in South Sudan matter. We hope that they remember that. We will never forget this opportunity to be with them. And in some way, we are bold enough to hope that you notice and remember them before the Lord, too. 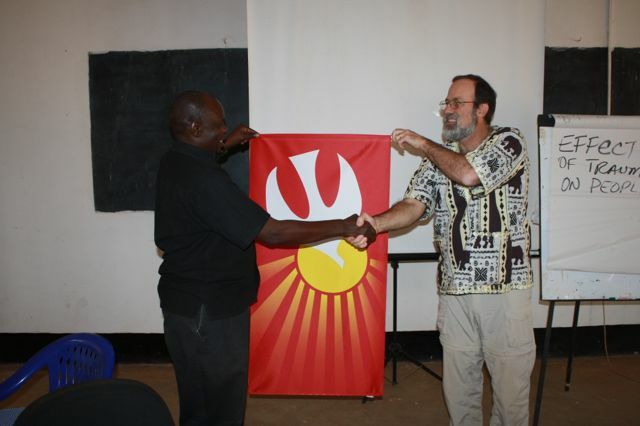 Ken White presents a gift from the Presbytery to assist the SSPEC in their care for Internally Displaced Persons. 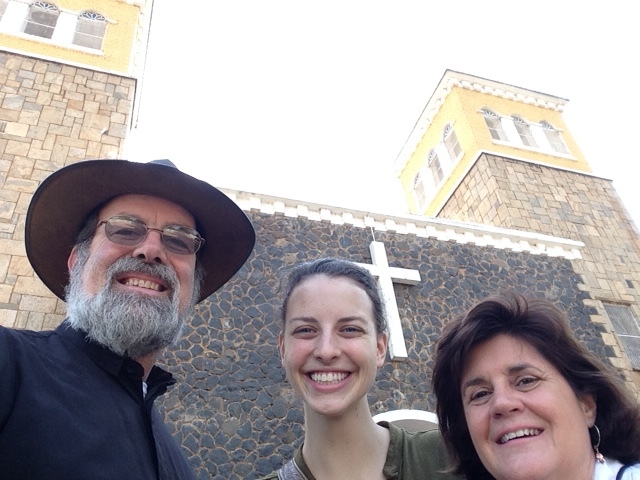 The Episcopal Cathedral in Juba is adjacent to our guest house. Is it poker night at the Guest House? Nope, I’m just helping the team sort out the South Sudanese currency… A twenty-dollar bill gets a big stack of these colorful bank notes. Did someone say BIRDS? Why, yes, I’ve seen a few. 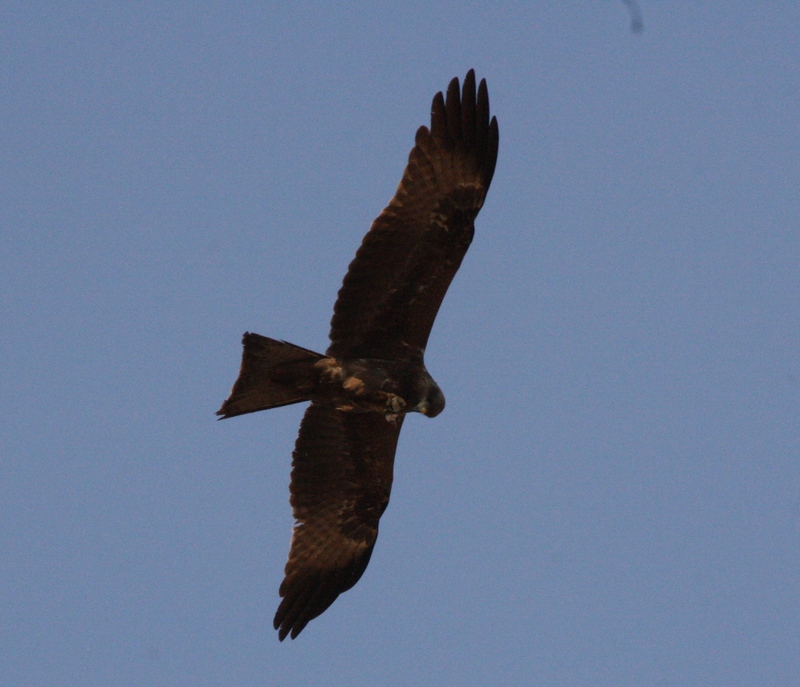 This is a Yellow-Billed Kite, a small hawk-like raptor that is ubiquitous here. 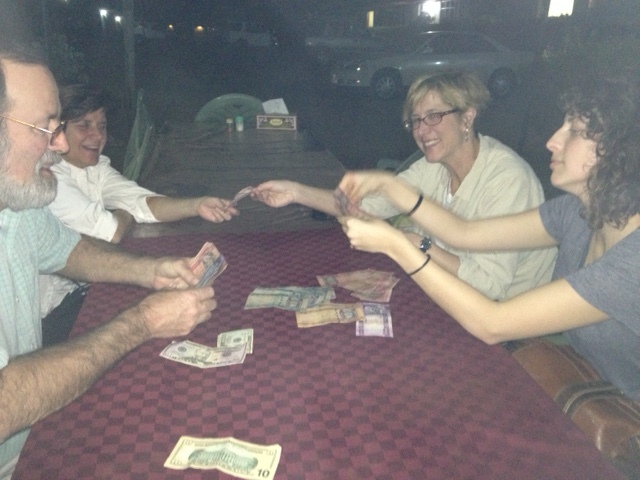 It’s about six a.m., and I have been sitting in the cool of the darkness here in Juba for about half an hour. The roosters and the muezzin are both seeking to get things moving, although in the quiet courtyard of the Episcopal Guest House, neither party appears to be gaining much traction. 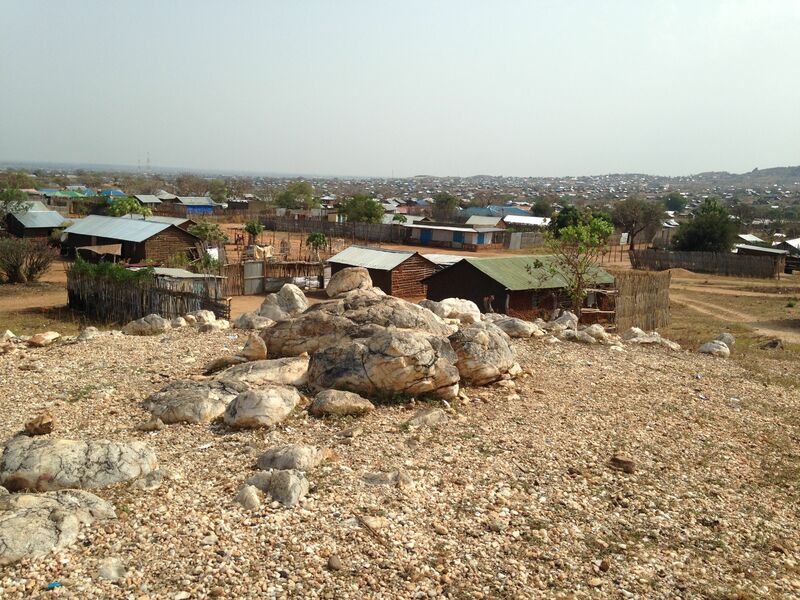 The good news is that six people and four suitcases from Pittsburgh Presbytery have arrived safely in Juba (two of our suitcases, apparently, were so impressed with the stark desert beauty of Dubai that they’ve elected to remain there for awhile). Our flights were timely and smooth. It was my first experience on Emirates Air, and it was simply amazing. Those folks have thought of everything – from 800+ in-flight movie/TV options to lamb kofta for lunch to a gracious and attentive staff… a thirteen hour flight is never pleasant, but I mean to tell you that these folks did everything they could to take the sting out of flying that far, that fast. Because of that, we arrived in Juba in pretty good shape, and we were greeted by an enthusiastic delegation from the South Sudan Presbyterian Evangelical Church (SSPEC), our partners here in South Sudan, several of whom came out onto the tarmac to greet us as we disembarked from the plane. The radiated from the pavement as we walked past a couple of other commercial airliners as well as a fleet of other planes and vehicles bearing the logos of the Red Cross, Doctors Without Borders, the UN, and other relief agencies. The first stop was the medical tent, where we were all given a health screening. 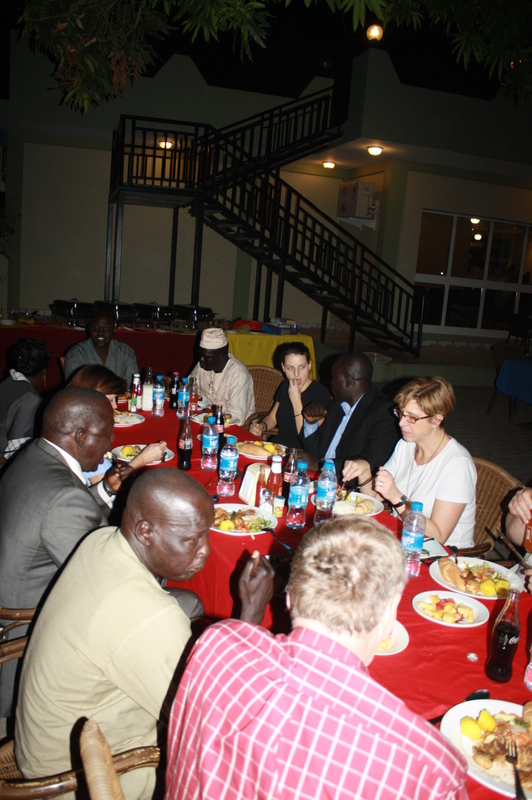 The highlight of our day was a welcome banquet that our hosts had organized at one of the city’s premier hotels, The Juba Bridge. 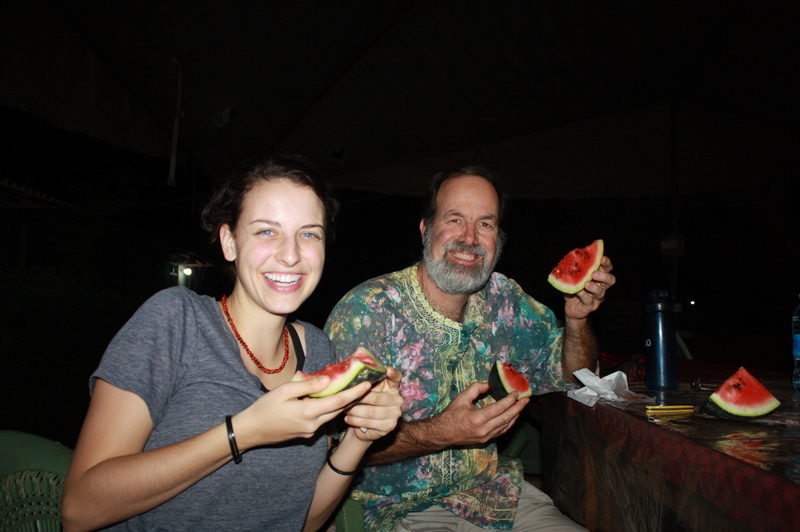 There was a long table set under a giant mango tree right on the banks of the White Nile, and as we listened to the river rush past, watched the sun set, and went through the exercise of familiarizing our teams with names and ministries, it was just perfect. We feasted, all right – not only on chicken and beef and talapia and rice and fresh pineapple and watermelon, but on the stories that were shared of God’s provision, guidance, sustenance and presence. Earlier in the day, we’d had a team devotion wherein Sharon asked each of us to think about Paul’s analogy of the church as the body of Christ in I Corinthians 12, and then to consider which part we’d like to be in the weeks to come. Many of our team indicated that listening, processing, and reflecting were gifts we’d like to exercise, and our colleagues in SSPEC were kind and gracious as we began our time together. There was laughter and joy and hope shared around that table. It was, as I have said, good. Very good. 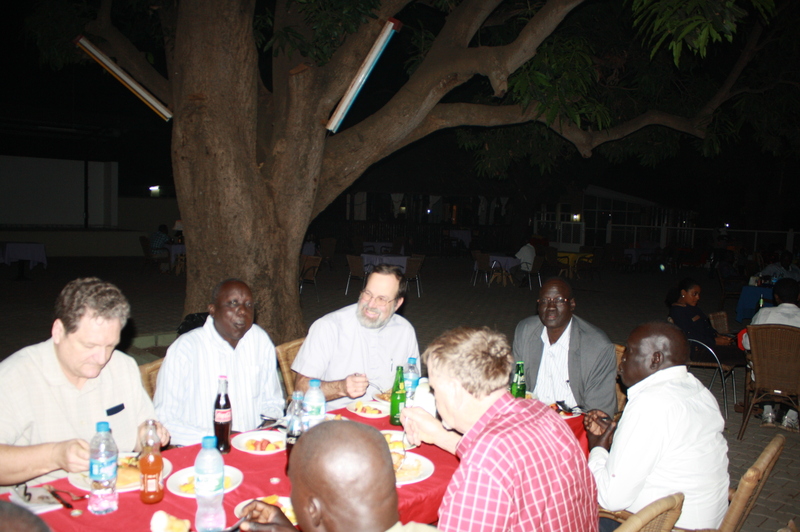 Under the mango tree at the Juba Bridge Hotel. To my left is James Paar Tap, SSPEC Moderator, and to my right is Madut Tong, SSPEC Deputy General Secretary. Those interested in some of the more mundane aspects of our trip will be interested in knowing that the ECS Guest house (images here), our home for the bulk of this trip, is a ministry of the Episcopal Diocese and consists of a number of housing blocks with double rooms and shared baths. There is a spreading canopy of trees (filled with magnificent birds! ), a large open-air tent for shade, and several administration buildings. It’s fenced, guarded at night, and even has electricity from 7 pm – midnight daily. For the daily weather in Juba, click here. No, we’re not in Pittsburgh anymore. Well, it appears as though at least the roosters have experienced some success in their ministry, and I can see the sky lightening and hear the voices of some of my colleagues. 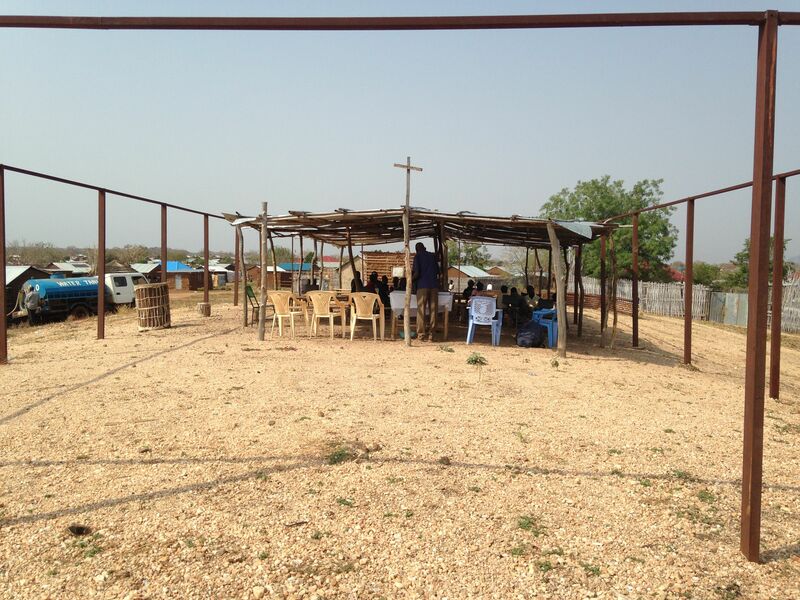 Today we will have a full day of visiting various sites in and around Juba, including the South Sudan Council of Churches, a prison ministry, some government officials, and more. We continue to ask for your prayers and delight in God’s provision for us. 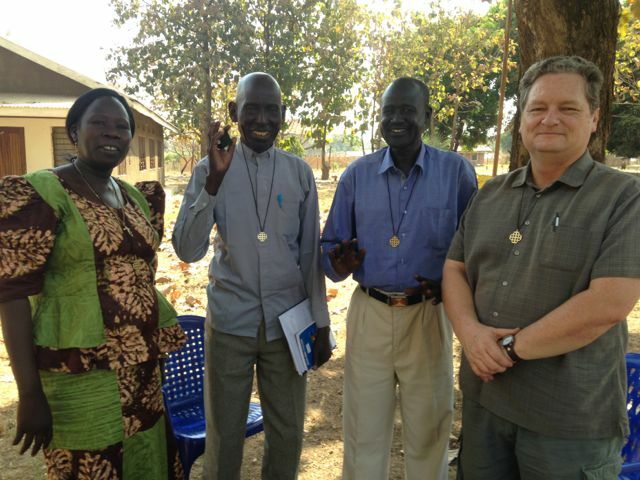 In January of 2013, I joined with my colleagues Jeff Tindall and Ken White for an exploratory visit to South Sudan. 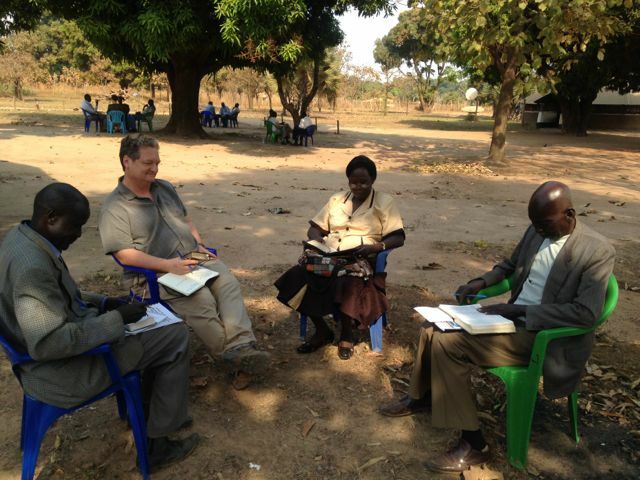 Together with three members of the Malawian church, we sought to discern whether or not God was calling the Presbyterian churches in Pittsburgh, Blantyre (Malawi), and Juba (South Sudan) into an intentional tripartite community. After a leadership retreat there was consensus that this was the exact right thing to do – and the relationship was launched. Since then, we’ve received several South Sudanese visitors in Pittsburgh, and we have joined together in a trip to Malawi. 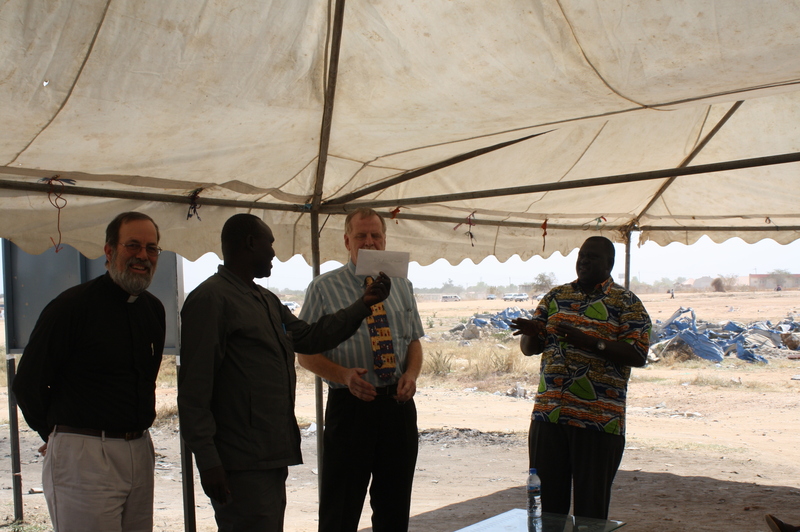 But the recent conflict in South Sudan has rendered us unable to visit with our sisters and brothers there…until today. 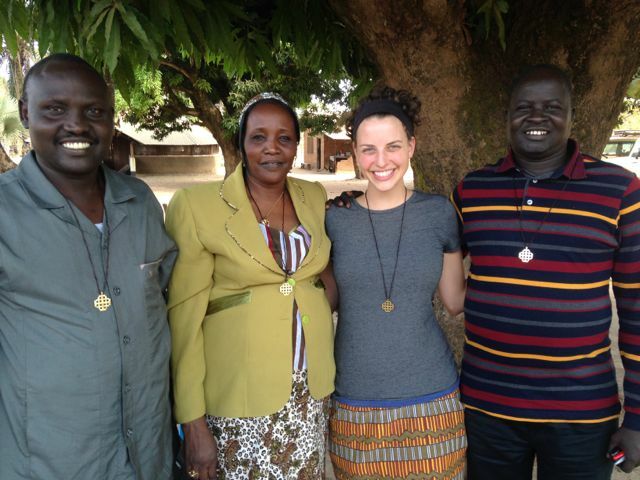 I’ll be joining five other travelers for an intentional (and, probably, intense) time of prayer and reflection on “the things that make for peace” as we visit the leadership and congregations of the South Sudan Presbyterian Evangelical Church (SSPEC) for worship, retreat, celebration, listening, story-telling, faith-sharing, and sharing meals. 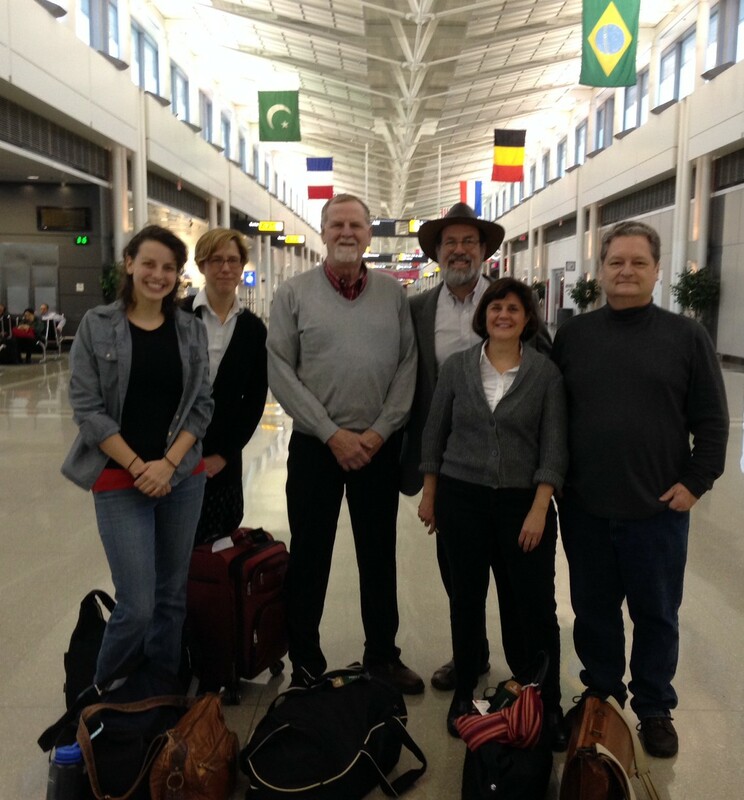 Susan, Ruth, Sharon, Ken, Gary and I leave today for Juba. 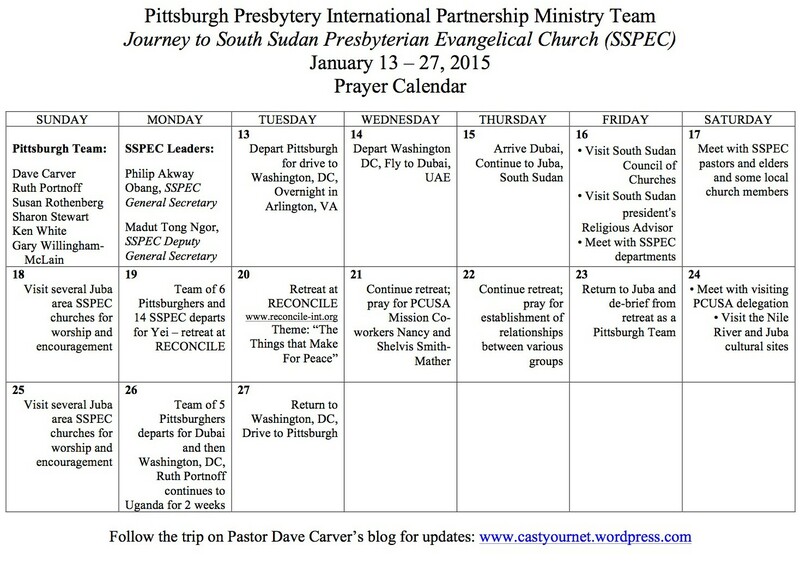 As the attached prayer calendar shows, we’ll stay in the capital city for a few days, and then head to the town of Yei for a retreat facilitated by our partners at the Resource Centre for Civil Leadership (RECONCILE). Our deep hope is that this time will plant seeds in and amongst us that will help each participant know more deeply the calling that the Lord has for his people in terms of modeling and sharing the call to live as Christ’s own people. 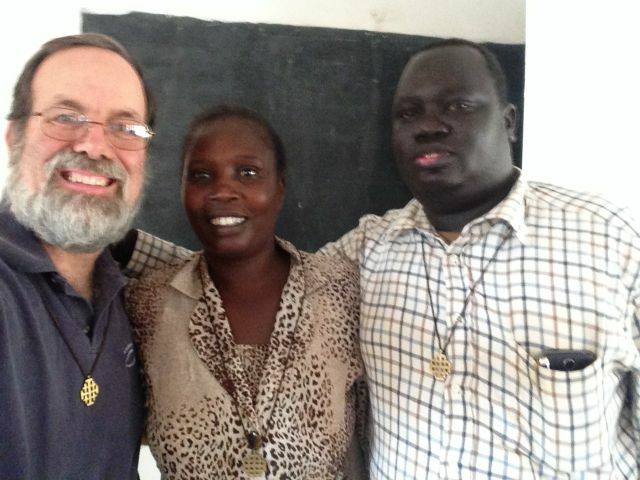 We further dare to hope that as a result of our time together, faith communities in South Sudan, the USA, and even elsewhere might be better able to reflect the love of Christ into a world that does not recognize such love often enough. My hope and expectation is that there will be further updates as internet connectivity permits. Please hold us and all who share in this journey in prayer. 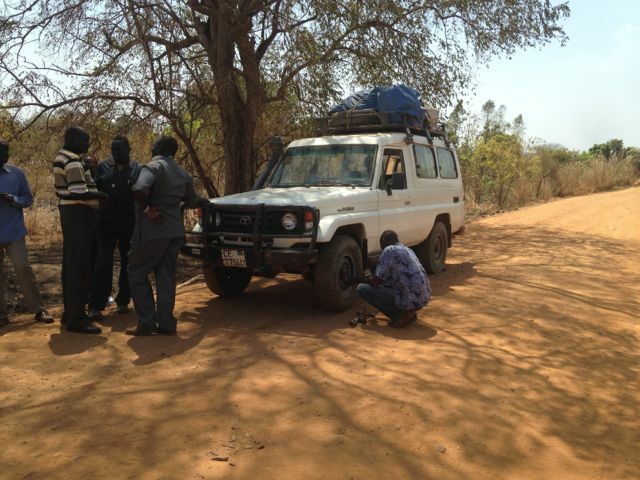 In the meantime, please take a few moments to learn more about South Sudan from the BBC. A posting from the UN is below. Click here for an overview of the humanitarian crisis and international response in South Sudan.